Availability:: Due to the custom nature of our product, please allow 2-4 weeks to manufacture your order. Exact Drawer Width*: 12 1/16" 12 1/8" 12 3/16" 12 1/4" 12 5/16" 12 3/8" 12 7/16" 12 1/2" 12 9/16" 12 5/8" 12 11/16" 12 3/4" 12 13/16" 12 7/8" 12 15/16" 13" 13 1/16" 13 1/8" 13 3/16" 13 1/4" 13 5/16" 13 3/8" 13 7/16" 13 1/2" 13 9/16" 13 5/8" 13 11/16" 13 3/4" 13 13/16" 13 7/8" 13 15/16" 14" 14 1/16" 14 1/8" 14 3/16" 14 1/4" 14 5/16" 14 3/8" 14 7/16" 14 1/2" 14 9/16" 14 5/8" 14 11/16" 14 3/4" 14 13/16" 14 7/8" 14 15/16" 15" 15 1/16" 15 1/8" 15 3/16" 15 1/4" 15 5/16" 15 3/8" 15 7/16" 15 1/2" 15 9/16" 15 5/8" 15 11/16" 15 3/4" 15 13/16" 15 7/8" 15 15/16" 16"
Exact Drawer Depth*: 17 " 17 1/16" 17 1/8" 17 3/16" 17 1/4" 17 5/16" 17 3/8" 17 7/16" 17 1/2" 17 9/16" 17 5/8" 17 11/16" 17 3/4" 17 13/16" 17 7/8" 17 15/16" 18 " 18 1/16" 18 1/8" 18 3/16" 18 1/4" 18 5/16" 18 3/8" 18 7/16" 18 1/2" 18 9/16" 18 5/8" 18 11/16" 18 3/4" 18 13/16" 18 7/8" 18 15/16" 19 " 19 1/16" 19 1/8" 19 3/16" 19 1/4" 19 5/16" 19 3/8" 19 7/16" 19 1/2" 19 9/16" 19 5/8" 19 11/16" 19 3/4" 19 13/16" 19 7/8" 19 15/16" 20 " 20 1/16" 20 1/8" 20 3/16" 20 1/4" 20 5/16" 20 3/8" 20 7/16" 20 1/2" 20 9/16" 20 5/8" 20 11/16" 20 3/4" 20 13/16" 20 7/8" 20 15/16" 21 " 21 1/16" 21 1/8" 21 3/16" 21 1/4" 21 5/16" 21 3/8" 21 7/16" 21 1/2" 21 9/16" 21 5/8" 21 11/16" 21 3/4" 21 13/16" 21 7/8" 21 15/16" 22 " 22 1/16" 22 1/8" 22 3/16" 22 1/4" 22 5/16" 22 3/8" 22 7/16" 22 1/2" 22 9/16" 22 5/8" 22 11/16" 22 3/4" 22 13/16" 22 7/8" 22 15/16" 23 " 23 1/16" 23 1/8" 23 3/16" 23 1/4" 23 5/16" 23 3/8" 23 7/16" 23 1/2" 23 9/16" 23 5/8" 23 11/16" 23 3/4" 23 13/16" 23 7/8" 23 15/16"
Drawer Insert Height*: 1" 2" 2 1/2" 3" 3 1/2 4" 4.5" 5"
Custom Built Drawer Organizer. 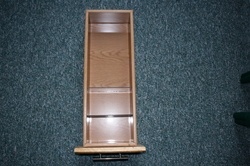 Great for organizing drawers in the kitchen, bathroom, bedroom, craft room, office, shop, etc. These drawer organizers are custom manufactured from clear polycarbonate. Custom built drawer organizer are made from 1/8" polycarbonate and 1/8" polycarbonate floor. Organziers are built based on customer's dimensions and specifications. 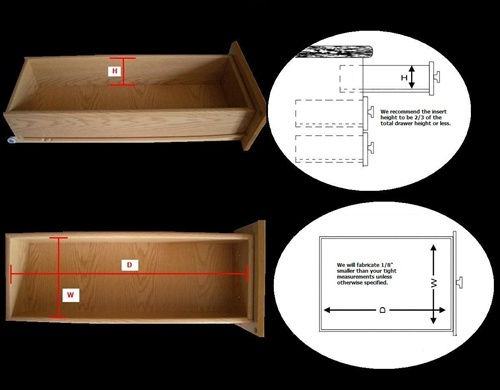 When measuring the inside width and inside drawer depth subtract from your measurment obstructions such as corner brackets and screw heads. Organizer must be paid for in full prior to production. Allow 10-14 days for delivery.